For the moment I’m kinda in a “quiet” period and remain in an “overall” uptrend theme. When I get excited about an important change in market direction, a lot of blog updates usually take place. Presently, there are some divergences showing in the 60 minute and daily charts. Also the wave count appears to be maturing. All of this could be early warning signs of a correction into late January (see cycles update in the next section). The expectation is the correction will be a point to add to holdings or resume speculative positions. The following is the 60 minute indexes found on page 10 of my charts. Notice some of the indicators have divergences where prices are trending higher and the indicators are making lower highs. I have always found the Hurst Cycle concept to be interesting and I’ll try to make this an integral part of my blog updates. You’ll notice how the dates of the anticipated cycle lows don’t change much from one month to the next (compare my last blog’s cycle charts with today’s). Only a sharp move up or down changes the cycle expectations. The first chart is the SP 500 cycles from 1950 to 2042. The semi-circle contact points at the bottom are cycle low dates. When we have numerous cycles bottoming at the same time or large cycles bottoming, these are usually important dates in stock market history. Due to the size of this chart, only the large cycles are visible. Obviously cycle lows shown beyond the present are predictions and not yet reality. Some cycle lows don’t produce bottoms. In a strongly upward trending market, a cycle low can be a sideways pattern followed by a breakout to the upside. Looking at the chart below you can see how several large cycle are approaching a crest and beginning a move to their cycle low. This is not a strongly upward trending market as portrayed by this chart. At best it shows the last stage of a bull market, which coincides with a large 3rd step in the wave count. According to Hurst’s Principle of Proportionality – Waves in price movement have an amplitude that is proportional to their wavelength. This simply means that longer cycles produce bigger moves up or down. Smaller cycles produce smaller fluctuations. The next chart is a close up of the above chart and it shows a confluence of cycle lows occurring from May to September 2013. 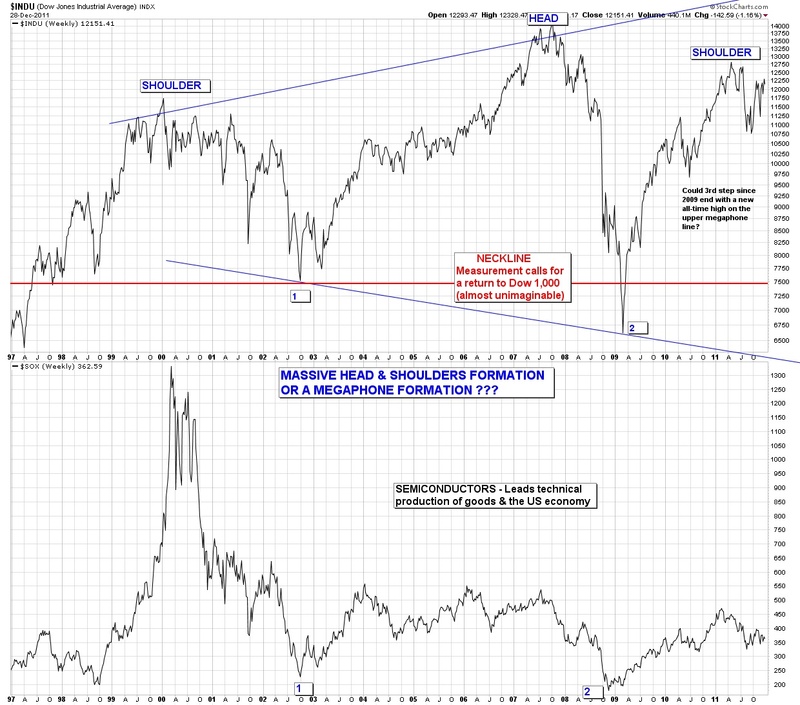 This appears to be anticipating the most important cycle bottom since March 2009. Further out the cycle low occurring in early 2018 is much larger and there are also several other cycles lows anticipated about the same time. This calls into play the Principle of Synchronicity – Waves in price movement are phased so as to cause simultaneous troughs. This means all of these cycles will bottom at the same time. This will likely be a time for a very important market low. 2018 could mark the end of a long period of bad markets that began with the bursting of the 2000 internet bubble. Please don’t get too caught up in the large cycles and forget that we have bull markets that occur in between these large cycle lows. March 2009 to the present is a good example. There’s a time to be bearish and a time to be bullish. You don’t want to be like some famous wave analysts and become so bearish that you miss the good stuff between cycle lows. 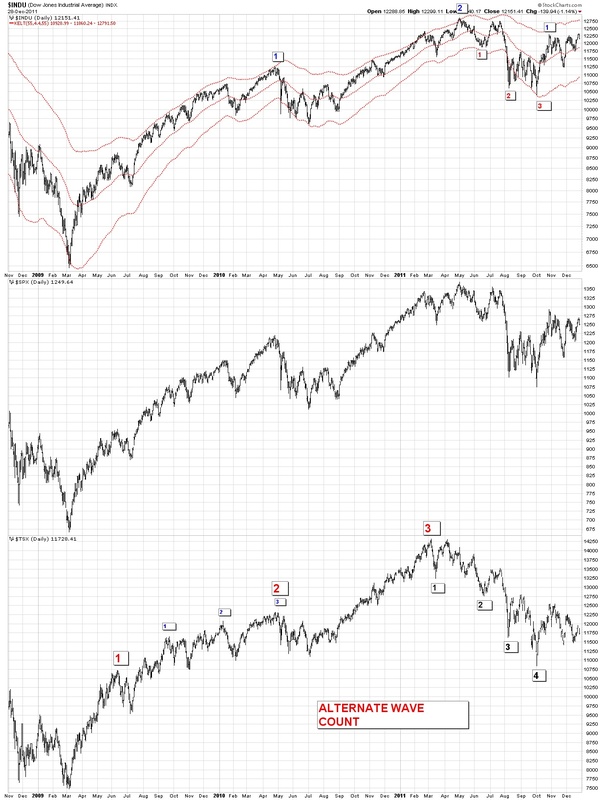 The third chart is also based on data from 1950 to the present and shows late February to early March 2012 as the date for the next important bottom (15/16 month cycle low). After that bottom the chart shows a lesser bottom occurring during May 2012. This chart is based on 62 years of data and it tries to fit the cycles to this large data-set. In the next chart we’re going to see a difference of opinion on the upcoming bottom based on a shorter data-set. The following cycle chart is based on data since late 2007 and is obviously geared towards events that have affected us over the last 5 years. Looking at this chart you can see how the next cycle low is anticipated in late January (instead of late February). For the moment I am inclined to believe the 2007 cycle data-set. If the late January cycle low is correct a decline should begin soon. Since this cycle low is less significant than the October low, it could be a quick correction with a rapid reversal similar to November 2011. This next cycle chart is based on data since 2007 and shows the important cycle lows over the last 5 years. Notice how it differs slightly from the chart based on the 1950 data-set. It’s simply squeezing the cycles to fit into the time frame selected. I think long data-sets are suitable for long cycles and smaller data-sets are more accurate for smaller cycles. We’ll see how that works out in the near future. I find these cycle charts to be of significant interest as it can give you an idea of when to expect bottoms to occur. Wave counting gives you an idea of where you are in the rally or decline. Altogether, these cycle lows coupled with wave counts can be of great help for narrowing down valid buy points. If you find these cycle charts interesting, the service “Hurst Signals” provides cycle charts and trading advice based on the work of J.M. Hurst, “More info at HURST SIGNALS” It’s an excellent service. Further information about Hurst’s Cyclic Principles can be found here. Lotsa good Hurst info here. You will find the best trend lines and wave counts on charts with longer time frames. This gives perspective to the lines and counts. Perspective was a favorite of Edson Gould. Page 31 through 45 are growth stocks with indicators. These are stocks that have been in a lengthy uptrend. One qualification is that they must not be severely damaged in a bear market so they can’t rise to significant new highs in the following bull market. The growth stocks show daily market action for the last 3 years and weekly prices since 1992. This gives a good perspective of how they have behaved in the immediate past (daily charts) and how they behaved during good and bad times (weekly charts). Each group of 3 steps must stay confined to a channel. Laying a pen or pencil on the chart will help you visualize the channel. As the trend progresses, all of the steps that make up a larger trend will also be confined to a larger channel. Sometimes the channel is not revealed until the surge phase has ended. When the market breaks a channel (regardless of the perceived wave count), the current step has been terminated. (Make sure your channel was correctly drawn before calling a termination). The correction following the second step is larger than the correction that followed the first step. Obviously the correction following the third step is a reversal. Has Step 3 Up Begun ??? This entry was posted on January 18, 2012 at 2:50 PM and is filed under UPDATE. You can subscribe via RSS 2.0 feed to this post's comments. Responses are currently closed, but you can comment below, or link to this permanent URL from your own site.